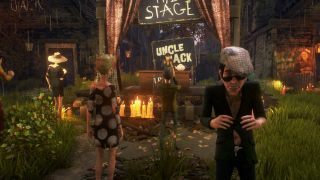 BigBagBlog – WE HAPPY FEW REVIEW: "A DYSTOPIAN NIGHTMARE THAT'S BASICALLY SOCIAL ANXIETY: THE GAME"
I wouldn’t be surprised if the working title for this open world, dystopian nightmare was Social Anxiety: The Game. It’s sinister version of a post-war England, of alternative facts, enforced assimilation and missing children feels particularly brutal in 2018, and once its claws are in your brain it won’t let go. We Happy Few doesn’t so much cut close to the bone as drill right down to the bloody marrow. 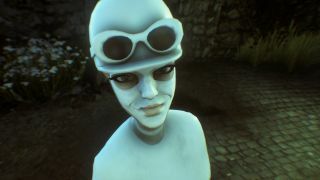 It doesn’t matter if you’re an unhappy wimp, a woman with a secret or a diabetic ex-soldier with issues, the world of We Happy Few is an unkind place. Each of the stories you’ll play through are dark, with echoes of the best Black Mirror episodes, but each will be subtly different, thanks to the shattering pasts and different skills of it’s heroes. Each character has a main storyline and a smattering of side quests, and you’ll guzzle everything. It’s one of those games – like Dishonored 2 – where you’re distracted by every room, every ruined house, anything that looks a little out of the ordinary because it might harbor just another nugget of twisted environmental storytelling. Unlike a lot of games where people will turn a blind eye to you scrabbling through their bins or walking around carrying a blade, how you behave in We Happy Fews matters. 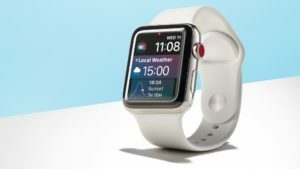 Not just that, how you look matters, and even if you can fake it, there are downer detectors dotted around the towns and in people’s homes, ready to catch you. You’re always on edge. Things are only a little more relaxed in the Garden District, a place of exile for people who aren’t on Joy. There you won’t get shouted at for running, but wearing your nice city clothes will make people aggressive, and looting a body or a chest will have the mob after you. I can’t remember another game that’s made me feel so aware of how odd my character, rushing around, punching and stealing, must look. 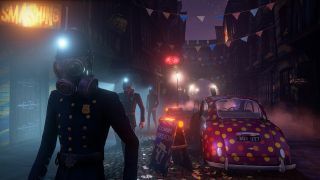 Games like Assassin’s Creed have obviously made stealth an integral part of their story and mechanics, but the anxiety in We Happy Few doesn’t come from failing a mission. It comes from being publicly humiliated, called out as different, and chased and screamed at until you can find a safe place to hide from the bullies. There are ways to level up and hide your motives with drugs and skills, but you’ll always feel on edge. Walking when you want to run, turning in the street to avoid trouble. Even though it made little difference to the game’s mechanics, I steered my character into the shadows, tried not to come face to face with NPCS. Honestly, it was a relief when the mob was small enough that I could just beat them to death with a cricket bat. The three characters you’ll play as – all broken in their own ways – stand up on their own and then some. 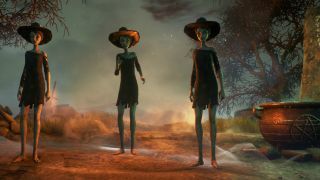 It could have been a strong game with just one story, but the addition of characters Sally and Ollie is both generous and damn clever. You get to see the same people and places from different perspectives. 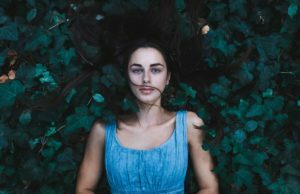 With Sally it’s someone working with the system – albeit with their own shocking secret to hide – as she does her best to keep her life stable while trying to supply the sinister constables with their favorite blackberry Joy. Elements of her story mean that time and certain materials matter, and instead of a skill for tinkering, she’s master chemist who has to use her abilities to survive. Ollie is a brilliant fighter and mechanic – with a passion for extracting TNT from dud German bombs – but also a diabetic in a world without an insulin stocked pharmacy on every, or any, corner. All three experiences are different, all three are excellent. Personally, I found Sally’s the most affecting – for reasons too interesting to waste on a cheap spoiler here – but I suspect everyone will see it differently. This interweaving of the stories isn’t a recycling job, it’s a narrative risk that pays off, casino jackpot style. 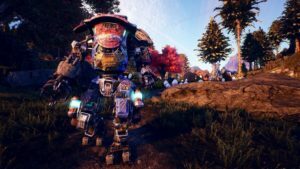 Smarter people than me might find issues with the way the game handles the material it does – and believe me the hot takes on this are going to be nuclear. There are times this game isn’t a comfortable one to play, not with the real world the way it is and this dystopia’s themes of separated children and fake news and Britain cutting itself off from Europe as cack handedly as possible. You’d be forgiven for thinking you were trapped in a Nigel Farage fever dream at times. I don’t need my videogames to change the world, but it feels important that a game is telling stories about just how effed up things get when you blindly follow government policies, block out anyone different and stick a massive happy face on. Spoiler: very effed up. Precisely because the story and the world stunned me so much, I can forgive it for some of the more technical issues that popped up here and there. A wonky framerate, cookie cutter NPCs – I must have seen the same little old lady a hundred times – and animation glitches were all dotted through my hours and hours (and hours) of gameplay, but at worst they were a distraction, a tiny pinch on the arm from the real world. In an ideal world a development studio would have time to fix all that stuff and make three cracking stories, but if Compulsion had to make a choice, I’m glad they poured that time into Arthur, Sally and Ollie. 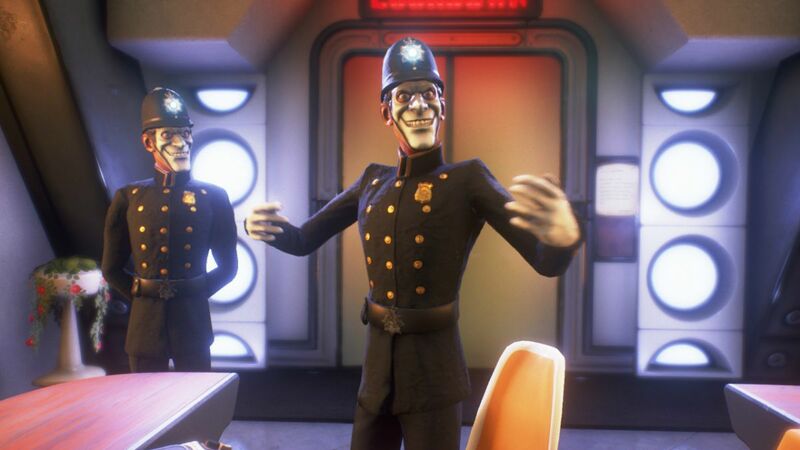 We Happy Few is available worldwide now on PS4, Xbox One, and PC.